Eren and Historia recover memories with the king's Power of the Titans. The Scouts prepare to rescue Eren. This was one major info dump of an episode! Let's answer some questions about Eren. He was apparently made into a Titan just moments before he ate his own father to receive the royal family's Titan Power - Control. Knowing Eren's character, he might be a bit mopey for a few days after finding out that he is truly an orphan and that he's half responsible. Questions remain on this side, however. How did Grisha Jaeger become an intelligent Titan without a Power? I'm thinking he somehow aligned with the huge Beast Titan. How did Grisha turn Eren into a Titan? He injected him with something, which hints at Ymir's origins of having "The King's Blood." 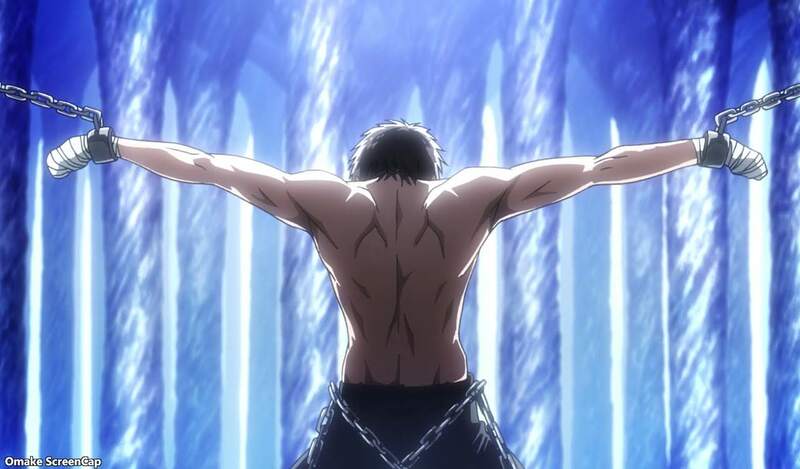 And when did Grisha do this to Eren? Was it right before the other Titans breached the Wall? How did Eren get back to town if he doesn't remember eating his father? How did Eren get out of Mikasa's sight for this to happen? Now, let's ask some questions from Historia's side. Is she really going to go along with the King's plans? Oh yeah. Rod Reiss is the actual King. Fritz was just the puppet figure. Historia's past also explained a lot of things, like who taught her to read, where the name Christa Lenz came from (fairy tale princess), and why she didn't remember anything. The King's family, all of them, had the power to make people forget, and big sister Frieda had to use it on Historia. That power also explained Mikasa's backstory. At one point, the Ackermann clan was the royal guard, but they and the Oriental clan were immune to the effects of the King's Titan Powers. The Orientals were always oppressed and the Ackermanns in recent history broke with the King's policies. Since neither people could be mind controlled, they had to be physically controlled. Mikasa's parents, an Ackermann and an Oriental, met in exile or the ghetto, or whatever they want to call it in this world. The Ackermanns also have a Titan Power, which explains Levi, Kenny, and Mikasa's extreme physical talent. So, we have a bunch of things answered, but we also have more story to be revealed. Grisha Jaeger was involved in some kind of rebellion plot. Neither the infiltrating Titans or the royalty know anything about this Beast Titan. Kenny has some kind extra agenda too. Things are definitely going to get messy very soon. Rod says that it's the first time Eren has been to the crystal chapel, but it's not a surprise that he might recognize it. And then he made him recognize it. Oh no, no, no! Eren ate his father! Armin asked when Eren became a Titan and when did he eat another Titan to get that Control Power, and here we are! Interesting. Eren can actually see the memories of the previous Titan he ate. He knows that Rod Reiss is telling Historia the truth about what happened to his whole family. Aw. We'll never see this pretty sister Frieda again. Erwin's father was right about the abrupt change in history and that propaganda was reinforced by the King's Power to alter memories. Ackermanns and Orientals don't do mind control. No wonder they were persecuted after they broke with the King on some issue. They have power too. That's how little Mikasa got so strong when she killed that kidnapper. Kenny said his sister Kuchel is having a kid. Was that Levi or the blonde girl in his squad? Kenny has some ideas opposing the King. I guess we'll find out what that is during the rescue operation with all the slashing and shooting next time.